It took Air Frances’ Air Bus 380, 5,658 miles and flying over Greenland at 35,000 feet to land in the city of lights where I had the best burger of my Squirrel life! Paris is known for its foodie landscape but did you know it has stolen America’s culinary staple? I have been gifted the experience of being able to travel to Paris on multiple occasions. Paris never gets old, in fact, I always discover something new. Little did I know when I was in Paris last December that my stay would be “burger themed”. Maybe it was the brisk air, or my romance with their pomme frites, this Squirrel girl was on burger patrol. Paris is the number one tourist city in the world and for good reason; the city offers romance on every corner, architecture that will bring a tear to your eye and cuisine that will have you wanting more after each bite. Paris, however, should be known for another little jewel, its hamburger. They have stolen one of America’s long time traditions! If someone asked you what comes to mind when thinking about America’s cuisine, most would say burger and fries. The french might have Joel Robuchon, but we have mother f***ing Bobby Flay, king of the grill! How Paris came to master the burger is still a mystery to me. I will have to do more investigating on my next trip! Someone has to eat the burgers over there…I’ll take one for the team-deal? This revelation came last December on a trip with my Mom. Innocently enough, after our hairs were coiffed to Parisian standards, we stumbled upon this petite cafe near Palais Royal. We honestly didn’t think much of it, except for the fact that we needed to eat asap. We tend to be eaters not gluten haters. So any cafe would do. 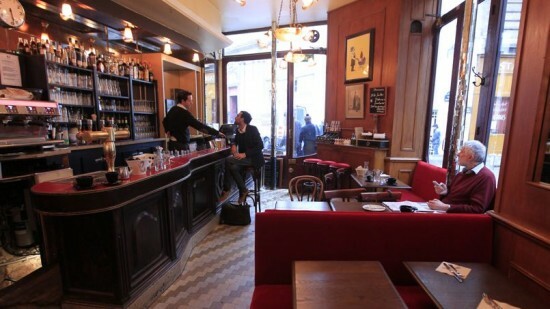 This charming cafe happened to be the first we saw as we made our way down the street from the David Mallet Salon. 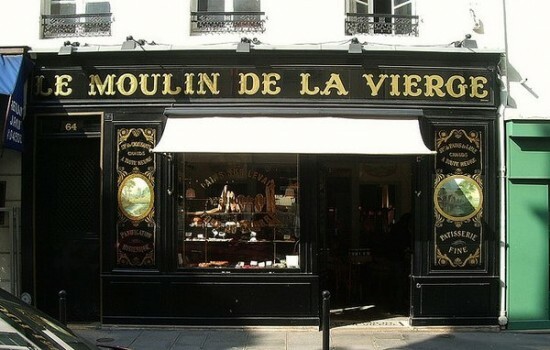 If you have been to Paris you see these cafes all over the place. I usually order a chevre salad and a glass of rose, but this time as I walked into the cafe, I opened the menu and there it was staring back at me. Done….I ordered the hamburger. It came with no cheese and I didn’t ask to add any because, well, that’s the American thing to do. As I glanced around the cafe I noticed a tiny window where the food came out. I peaked in and saw the chef cooking away. It wasn’t Joel Robuchon it was a just a normal dude manning the kitchen. How this obscure cafe, with four tables and a few seats at the bar produced the best burger is beyond me. The moment arrived and the plate of wonder was in front of me. Suddenly, the roof opened, the clouds parted and rays of sunshine the color of french fries came beaming down on my table. I was about to embark on a culinary adventure my taste buds had never experienced before. As I cut the hamburger in half, I felt the presence of eyes staring at me. Guess who? A classic Mom move that my family is all too familiar with…stares mean bites! As I focused back on the task at hand, I tasted the warmth of the bun, the juiciness of the burger and flavors that burst with each bite- this hamburger was king. It seemed simple enough with lettuce, tomato and grilled onions in some kind of secret sauce. I suspected this component of the dish was the reason that made this particular burger the best I’ve ever had. The meat itself was tender and juicy and full of flavor! I am particular about the buns with my burgers; not too ‘doughy’ and just enough grill marks to add a smokey flavor is what I would call a prefect bun. 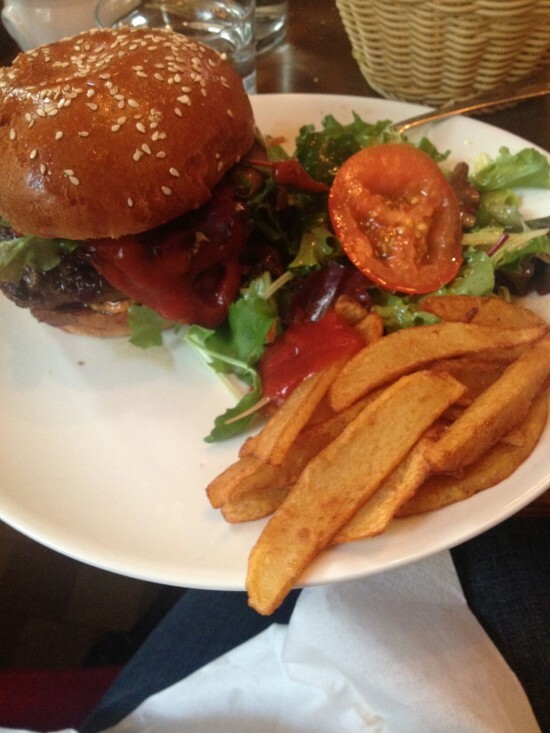 It’s not a surprise that the bread with my burger was divine; I am in Paris, the country known for its baguette! The burger put me in such a great mood that I decided to share and give my Mom some bites…well, she did buy me those Celine kicks so there you go! As my food parties continued, irony did too. The next night while dining in a tiny restaurant in Montmartre, we sat next to America’s grill master, Bobby f***ing Flay! The Universe definitely has a sense of humor. Chef Flay was friendly and I shared with him that I just ate the best burger! I didn’t want to offend the Chef whose known for his restaurants in the States called “Burger Palace”, but he was intrigued and wanted the details. I gave him the name, Le Moulin De La Vierge and explained how the roof opened and the clouds parted ways….Chef Flay seemed impressed! Months later, I heard that his burgers have grilled onions in some kind of secret sauce….I kid, I kid. As I reminisced about my burger themed Parisian trip on the eleven and half hour flight back to Los Angeles, I had a random thought about the genius who decided to slap a few pieces of bread between some cow meat and call it a burger? Maybe this came out of mundane meat eating back in the day? Maybe it was Bobby Flay in his past life? However, the burger originated, one thing is for sure, Paris has stolen America’s culinary staple. Ha! Thanks Sally! I will have to go on burger patrol in LA..will get back to you on it!